The time is past when digital technology in translation was no more than a supporting tool. The digital revolution is transforming the landscape of translation theory and practice. From translation memory tools to online corpora and databases, to machine translation and to cloud-based workspaces, technology is making translation more effective and time-efficient, while changing the roles and profiles of translators themselves. Furthermore, beyond enhancing and facilitating the translator’s work, the new technologies are making a profound impact on the very nature of our discipline. Summary of the participation: presentation of the EasyTV project by Dr Pilar Orero. Place: Campus of the Universitat Autònoma de Barcelona, Bellaterra. -TransMedia Catalonia (TMC) research group’s community manager. -UAB Department of Translation and Interpreting and East Asian Studies’ community manager. -Different associations of citizens with functional diversity TMC has been working with. -Translation and Interpreting Faculty’s web manager. -UAB’s Research Vice-rectorate (to make the information circulate among all the campus). Summary of the participation: May 17 is the Global Accessibility Awareness Day (http://globalaccessibilityawarenessday.org). Organisations and Institutions around the world organise simple meeting to raise awareness on accessibility, mainly web/digital. Events are organised by Google, Microsoft, Yahoo, universities, associations etc. The TransMedia Catalonia research group celebrated the Global Accessibility Awareness Day launching the first TransMedia Catalonia Open Day. The group’s researchers presented research projects they are currently working on (including EasyTV) and discover accessibility progresses in the areas of immersive technologies, audio description, subtitling, electrophysiological research, quality models, and development of an app for media accessibility. The event was organised in collaboration with the EU funded projects UMAQ (project n. 752659. ), ACT (project n. 2015-1-ES01-KA203-015734), ImAc (project n. 761974), EasyTV (project n. 761999), ADLAB PRO (2016-1-IT02-K203-024311), the Spanish-funded project NEA (project FFI2015-64038-P), and the Polish-funded project ADDit! (1311/MOB/IV/2015/0). Matamala, Anna; Orero, Pilar; Rovira-Esteva, Sara; Casas-Tost, Helena; Morales, Luis Fernando; Soler-Vilageliu, Olga; Agulló, Belén; Fidyka, Anita; Segura, Daniel; Tor-Carroggio, Irene (2018) "User-centric approaches in access services evaluation: profiling the end user". Ineke Schuurman, Leen Sevens, Victoria Yaneva and John O'Flaherty (eds) ISI-NLP2 (Improving Social Inclusion using NLP: Tools, Methods, Resources) 2018 Workshop Proceedings. Proceedings of the Eleventh International Conference on Language Resources Evaluation (LREC 2018). París: ELRA, 1-7. ISBN: 979-10-95546-12-2. The purpose of BIT Audiovisual INNOVA is to offer help in the notification and promotion of new products and services presented at the trade fair and that are notable for their innovative nature. Kind of event: audio-visual technology trade fair, industry. 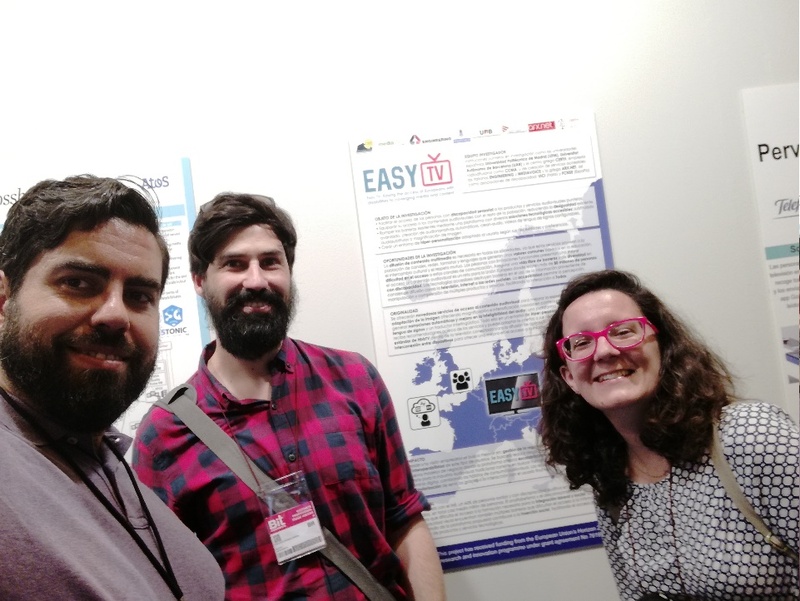 Poster presentation (8-10 May 2018): EasyTv was selected together with 9 more initiatives to be presented as a poster in the I+D+Bit, the Research and Innovation section of the event. Oral presentation: EasyTV was also selected as one of the most interesting initiatives among them, allowing a short presentation of the project (9 May at 17:30h) in the event forum. The 6th TransMedia Catalonia International Meeting (TIM) will be held on 21 March 2018. Outreach: 12 participants, among university’s PhD students, researchers from the Transmedia Catalonia Research Group and invited researchers. Summary of the participation: Daniel Segura Giménez delivered a presentation on his PhD dissertation, called “Reception Study on the Users of a Crowdsourcing Platform for Catalan Sign Language Interpretation Videos”. During this presentation, he explained the sign language related technologies being developed by the EasyTV project.